Designed with ultimate relaxation in mind, this deep tub allows you to submerge your body beneath warm water and let the stress of the day melt away. Stone resin construction provides that white finish that adds timeless style to your decor. Because it is all natural, it retains heat for longer bathtime enjoyment. Feel free to drop in those colorful bath bombs without fear of staining because the stone resin is a non-porous material. This stand-alone bathtub should be paired with floor-mounted hardware for a dramatic yet vintage-inspired effect. A centrally located pop-up drain comes in your choice of finish, making it easy to coordinate with your fixtures of choice. Not only is this bathtub dramatically stylish, but it is also an environmentally friendly choice. 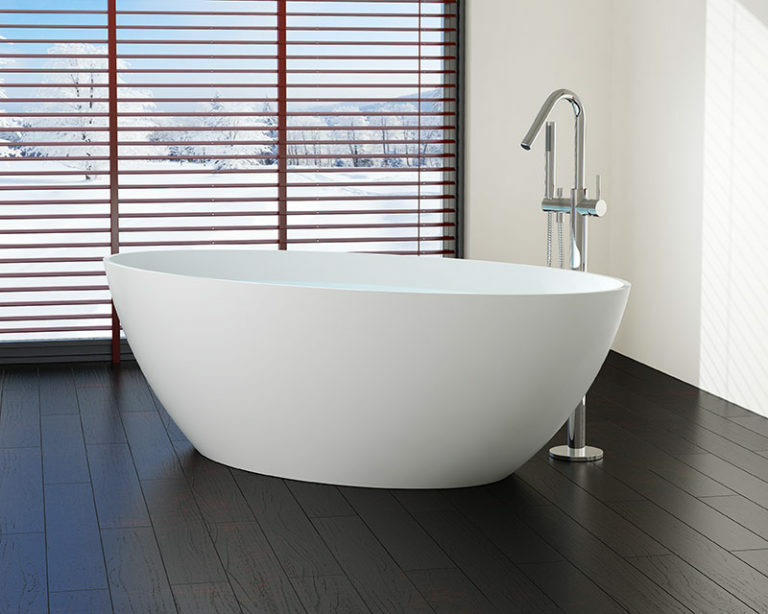 This freestanding bathtub features your choice of a flat matte or high-shine glossy finish. I’m writing this review following a recent tub purchase from Badeloft. Tyler was excellent to work with and the tub arri…ved well packaged in short order. Installation by my local plumber was fast and painless leveraging the high quality documentation provided. My wife and I believe the tub looks stellar in our contemporary-styled renovated bathroom. We couldn’t be more pleased. Thanks Badeloft!!! !